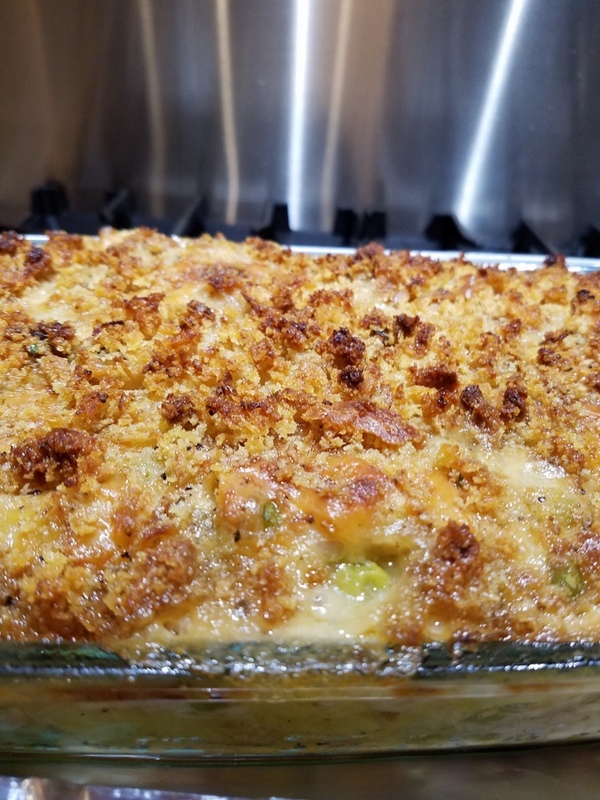 This is my take on tuna noodle casserole. Fresh lemon crumb topping and lemony-peppery pappardelle pasta makes for a delicious transformation from ho-hum to fabulous! *Use oil packed tuna to avoid dry clumps of tuna in your finished dish! Cook pasta per package directions in boiling water until al dente. Drain and set aside. You may want to drizzle pasta with a little olive oil or add some pasta water to keep noodles separated until ready to use. Sauté onion, garlic and celery in 1 Tablespoon olive oil until soft and onion is golden. Add butter and additional oil to the pan. When butter-oil mixture is bubbling, sprinkle 4 Tablespoons of flour into the pan and whisk until a roux is formed. Cook the mixture on low heat, stirring constantly for 5 minutes. This will prevent the finished dish from having a floury taste. Add wine and lemon juice. It will foam up – just keep stirring it. Whisk in the milk slowly and continue to whisk/stir over medium low heat until sauce begins to thicken, about 5-7 minutes. Add Romano-Parmesan cheese in small amounts by hand, stirring after each addition and tasting until your desired flavor is reached. Stir to combine. Once the sauce has reached its desired flavor, gently stir in peas, drained tuna and mozzarella. Taste for salt and add to your liking. Add plenty of freshly ground black pepper to the sauce and mix together. Spray or butter a casserole dish large enough to accommodate the mixture. Add al dente noodles to the casserole dish and pour the sauce over the noodles, mixing to coat all noodles. You may have some leftover sauce. Shred 2-3 pieces of whole grain bread to form soft bread crumbs. With your hands, mix together the breadcrumbs (Dave’s multigrain bread is very good for this), parsley, and the zest of 1 lemon. Add enough olive oil to moisten and sprinkle the mixture over the top of the noodles. Bake for 45 minutes at 350 until hot and bubbly and the topping is golden brown.